During the first night of the “America’s Got Talent” live shows hosted by Nick Cannon, if the judges – Howard Stern, Heidi Klum, Howie Mandel, or Mel B, give four X’s to any of the acts onTuesday, the performance is over. There weren’t any “X’s” given out, except one by Mel B by accident when she was participating in a ball in the hand trick by magicians David & Leeman. There were a lot of nervous acts on stage where Radio City Music Hall got the better of them. They learned their fate on Wednesday’s Results show. 17 and 18 year old tap dancing duo from Chicago. Howard called them “ordinary” in their first audition. During Tuesday’s performance Howard said, “it was nice. You added the dancing girls” and he said which only pointed out that they needed something different. Mel B said “What a great way to open-up America’s Got Talent tonight!” Howie said they are on the right track. This upped the danger of their act by having Valo ride a bicycle inside of the contraption on top of Bobby’s head. Howard was impressed, “I think you deserve a vote for surviving! You know how to fill-up a stage and entertain the audience. This is a fabulous act.” Heidi said “go big or go home, and you went big!” Mel B said “It was awful!” She was frightened that something wrong would happen. Mel B meant “awful” in a good way. A Big Party On Stage! Straight To The Grand Ole Opry! Howard said he’s a fan, but if he was at a concert this would be the performance where he would go to the bathroom or go get a soda… “I didn’t feel the same emotion behind this performance ,” said Howard. Howie said he liked this Pop song choice better. But he thinks their in the wrong city. He recommended Branson. Heidi said they could go straight to the Grand Ole Opry. After Mel B asked Howie what the Grand Old Opry is, she was honest with them and told them “Radio City Music Hall swallowed you up tonight,” she thought they weren’t big enough. Howard loved this unique jump-roping “What’s great about your act is that it’s LIVE. It was perfection!” Heidi said she’d never seen jump-roping on a trampoline and loved their act. “That was off the chain!” Said Mel B, and she want’s to learn how to do it. Howie liked that they added black-light to the performance and making something so simple such as jump-roping, and blowing-it up making it spectacular. Flight Crew Jump Rope told Nick that they can beat perfection. “It looks like a kaleidoscope coming together. Really beautiful. Mel B said said “It’s very pretty. I do think you are an acquired taste. I’m not sure you’re for everyone.” Howie said they are beautiful to watch and called them “great.” Howard said they brought out a “weird energy in the house…there was a lull in the energy” and didn’t think it went over as good. Emily graduated from high school early to move to Nashville. She was focused on making it big. But when her record label dropped her, she gave up. Mel B loved her performance, “You just hit every which way possible” she said “whoazer”. Howie called it the best act of the night so far. Howard said he joined AGT because of people like Emily West. He called her “magnificent” and she is “so on the money.” Heidi called her a star and that Emily has the total package. JD’s Radio City Music act began with him in a suit before he stripped down to a wresting outfit. He put his arms in fire, then ran into blocks of ice again. Howard said “I love you, I love you!” He liked that JD repeated the ice trick so people could see it live. Mel B was wencing and asked if he wad disoriented from running into the ice and called it a “proper show.” Howie was amazed that JD wasn’t bleeding anywhere. “It was an arc of a story that began in a suit and ended in a block of ice.” Heidi loved it and said he reminds her of the Tasmanian Devil because he runs around destroying things. Afterwards, JD told Nick that he almost blanked-out from running into the ice. The “One” in ONE DIRECTION! Miguel ended the show singing Beatles song “Come Together” and pulling off a wonderful, pro-like performance. Heidi said he was smart by singing a Beatles song and that he was “adorable.” Mel B reacted by calling it a “hot performance!” Howie said if it was the very last act that they saw, “I think that performance would win the $1 million,” and said Miguel is the “One” in “One Direction.” Howard rained on the parade – “I felt the performance lacked some charisma” and said he’d go through based on his charisma and looks, but needs to find his way. 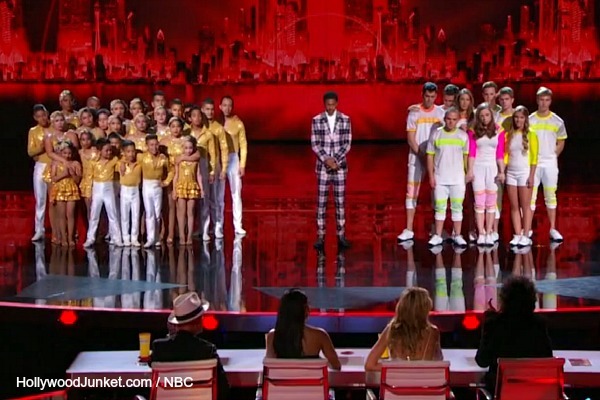 In the Results show, only five out of the eleven acts that performed on Monday moved on to the AGT Semi-Finals to compete for the grand prize. That means seven acts will be eliminated. Host Nick Cannon asked Mel B is she was nervous. She responded”of course I”m nervous. They put on a great show last night. This is crunch time,” and that she’s worried for everyone. The first act announced going into the Semi-Finals was Emily West. She was called onto the stage with Jasimine Flowers, Valo & Bobby who did not go through and went home. Howard reminded everyone that “you have to be memorable” and that when she was done performing, he went home singing her song. Heidi said Emily’s performance was flawless and gave her advice for her next performance – to just keep being herself. The next three contestants to step-up were: Julia Goodwin, JD Anderson, Miguel Dakota. The third act moving-on was Miguel Dakota! There was a lot of screams to hear his name called. Nick said he is a super-star already. Heidi said she was very pleased and that Miguel has a lot of potential. But he has to be stronger on the vocals next time. The remaining three acts of the night were David & Leeman, Baila Conmigo, Flight Crew Jump Rope. The fourth act announced to be going through to the Semi-Finals was – David & Leeman! They said that they were terrified waiting to hear the results. It’s up to the judges to decide who the last act going through will be. The final act of the night to go through was based on the judges decision. Heidi voted for Baila Conmigo, Mel B went with Flight Crew Jump Rope, Howie went with “what’s unbelievable” – Baila Conmigo. It was up to Howard Stern to make the deciding vote! Howard said, “on a different level they are equal. Jump roping and not making a mistake is unbelievable. The act that was a little bit more interesting and brought the party last night was Baila Conmigo.” Baila Conmigo will be joining Emily West, Dan Naturman, Miguel Dakota, David & Leeman in the Semi-Final Live Shows! The performers at Radio City Music Hall next week to get their shot at making it to the Semi-Finals are: Jaycob Curlee, Aerial Animation, Livy, Matt & Sammy, Mat Franco, John & Andrew, Loop Rawlins, Andrey Moraru, Darik Santos, Act II, Juan Carlos, Hart Dance Team, Mara Justine.